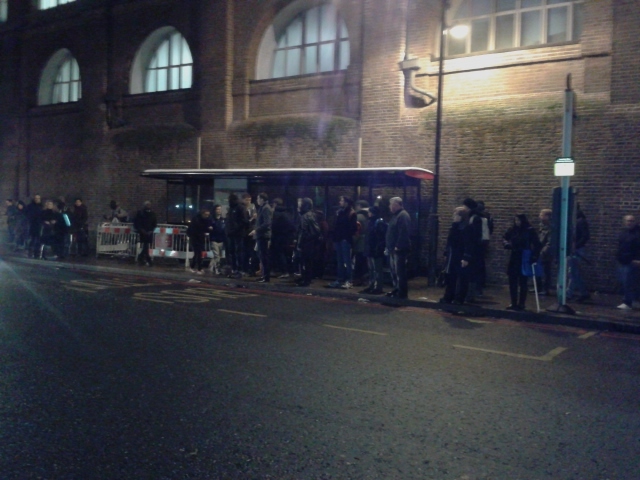 At Transport for London and LB Camden’s all new improved King’s Cross Station York Way bus stop tonight passengers are still in the dark (see picture taken at 6.30pm, left). The bus stop should be lit making people waiting feel safer and enabling people to read the information to the rear of the shelter. But the lights have not been working since the stop on the new widened pavement was installed in October. The problem has been reported to Transport for London and we’ll report on how quickly it’s now rectified. This entry was posted in Kings Cross Station Refurbishment, Road Safety in Kings Cross, Transport and tagged Bus stops, Camden Council, Gyratory, King's Cross station, LBC, Road safety, TfL, Transport for London, York Way. Bookmark the permalink. Thank goodness for King’s Boulevard meaning many residents further north no longer have to face the gauntlet of crowded bus stops, ‘party-goers’ and fumes up York Way. Are the parked bus drivers complying with the law against running their engines to keep the heating on this winter? We have email correspondence from TfL stating that the lights at the stop have not been connected to a power supply since the stop was built so it is impossible for the lights ever to have worked. TfL states that the delay is due to Camden LBC requiring the required excavation, connection and reinstatement to take place in one day – doesn’t seem an unreasonable requirement to me though and I don’t understand why it should add to the delay.